How do I check out a patient? 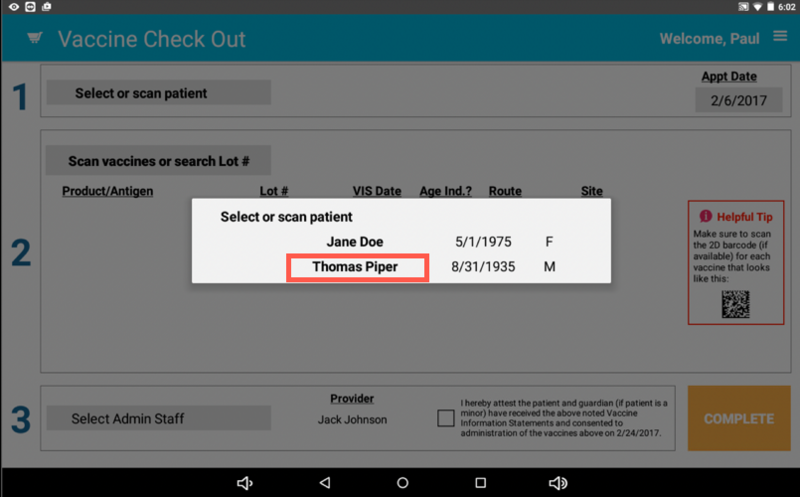 How do I scan out a patient on the VaxHub? Check-Out is the final step to vaccinating your patient and completes the Risk Free Guarantee. And it's super simple! To begin, open the VaxHub app and log in. Choose a patient. 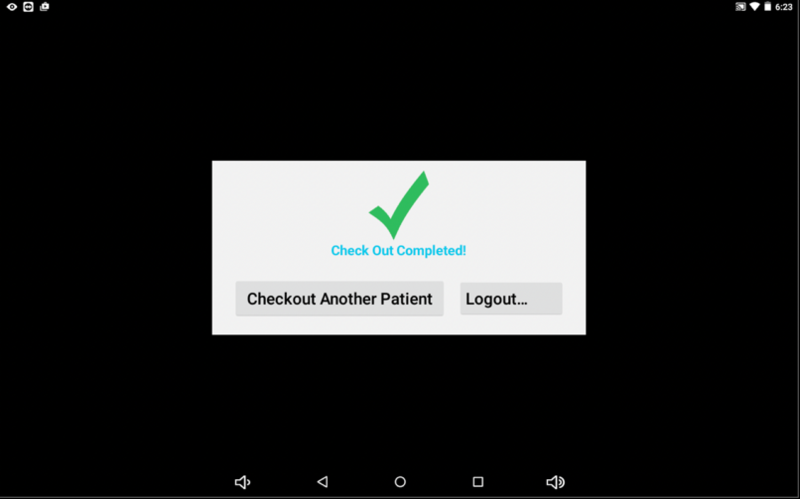 Scan the barcode on the patient's consent form or tap "Select or Scan Patient." Then, choose your patient from the list. Choose the vaccine(s). Next, using the built-in barcode scanner, scan the vaccine or enter a lot number to report which product(s) the patient is receiving. The preferred action is to scan the 2D (or "smart") barcode on the vial or pre-filled syringe, as it captures both the product name and lot number. However, if the vial will not scan -- or if you do not have a barcode (i.e. 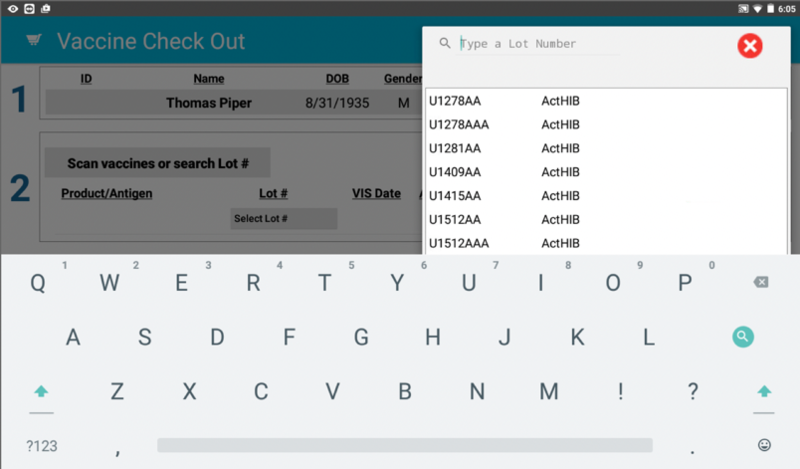 you accidentally tossed the vial into the sharps box before scanning) -- you can manually enter the lot number by tapping "Select Lot #" and using the onscreen keyboard to enter the lot number. Hint: 0's are always zeros, not letters. If you scan the 1D (or "grocery store") barcode on the vial or pre-filled syringe, the Hub will capture the name of the vaccine, but you will have to manually type the lot number, just like when you choose to "Select Lot #." Age indication warning. If you scan a vaccine that is out of age indication for the patient, a safety warning will pop up on the screen. You can override the age indication, but it is imperative that you change the patient's method of payment to Partner Bill so you can provide clinical justification to the insurance company. For safety and insurance coverage reasons, we cannot bill for any vaccine given out of age indication. For more information, see Giving Vaccines Out of Age Indication. 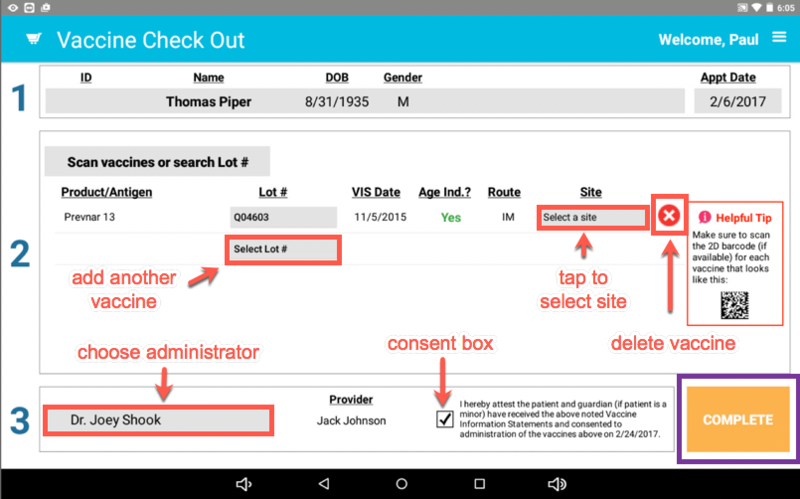 Site(s), Administrator, and Consent. 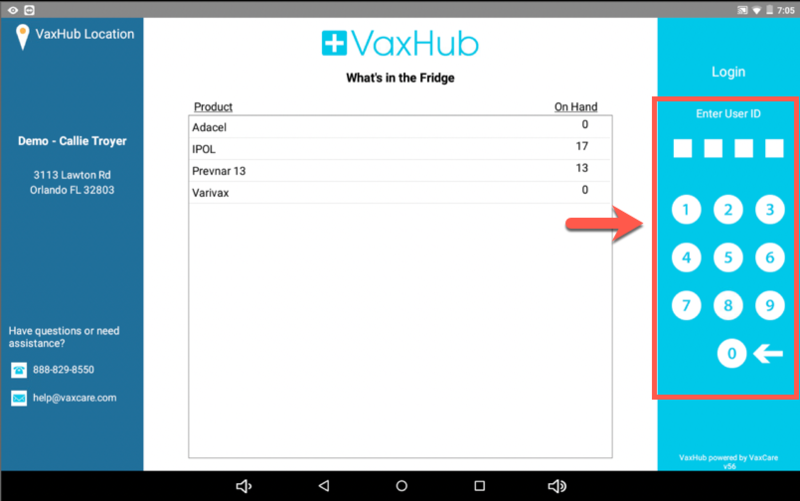 As shown in the image below, you can add more than one vaccine by simply scanning each product. You can also delete a vaccine using the red X icon to the right of any of the products. 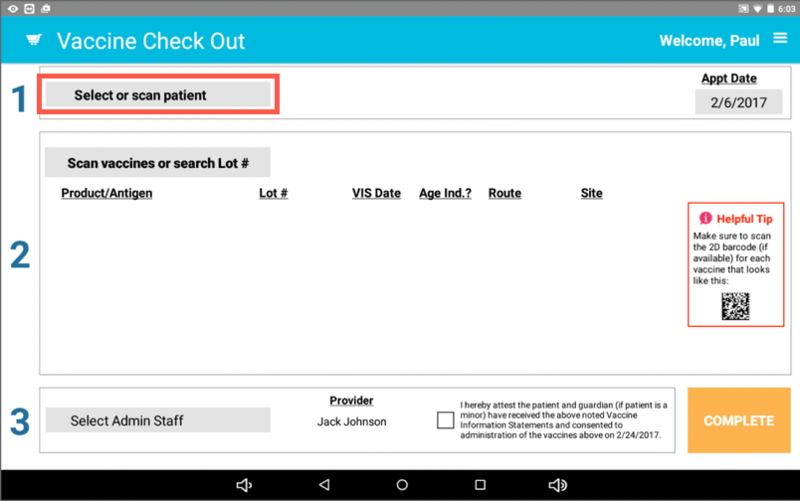 Once you have scanned all of your doses, choose sites for each of your vaccines by tapping "select a site" and choosing an option from the list below. 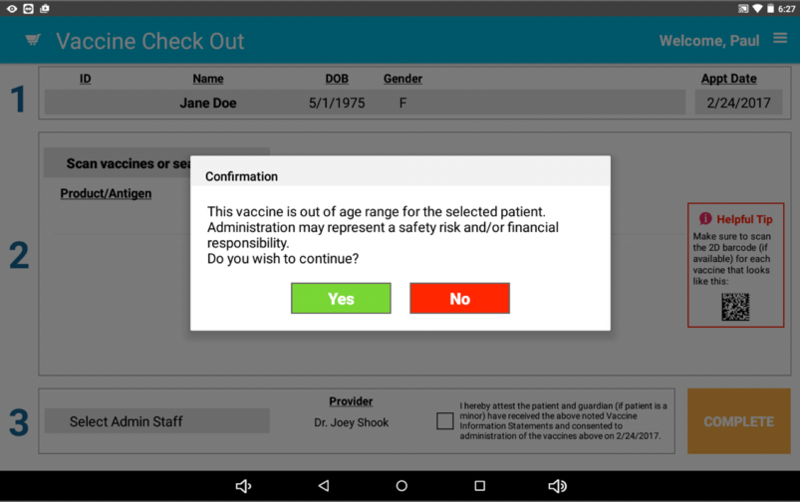 Next, choose the administrator of the vaccine(s) and affirm the patient gave the administrator informed consent by checking the consent box. Completing the check out. When you're done, select COMPLETE. This will give you a confirmation message and a green check mark indicating the patient's check out is complete and their information sent to VaxCare! Within 1-2 minutes, the inventory will update on the What's in the Fridge report.